The ‘curse’ of natural resources on economic development has been well documented, but there is no consensus on its underlying causes. Exploiting the formation of new Indian states in 2001, this column shows that the effects of state breakup on local economies differ systematically across natural resource-rich and resource-poor areas, in line with the spatial distribution of natural resources within states. The relationship between resource abundance and economic outcomes flows, at least in part, through a political channel. While the ‘curse’ of natural resources on economic development has been widely documented, there is still no clear consensus about the underlying causes. Traditional economic explanations range from resource abundance adversely affecting a country’s terms of trade, to traditional resource extraction methods causing a drag on technical progress, and volatility in natural resource world prices generating high levels of uncertainty and discouraging risk taking in other sectors. More recently the focus of the debate has shifted towards political economy related explanations of the curse (e.g. Robinson et al. 2006), but uncovering clear evidence of a link between the curse and political institutions in cross-country comparisons remains challenging. More recent work has thus turned to studying this question within countries (Brollo et al. 2013), as we do. Our new study uncovers evidence of this link in a within-country comparison, but also provides evidence of a plausible mechanism (Dhillon et al. 2016). 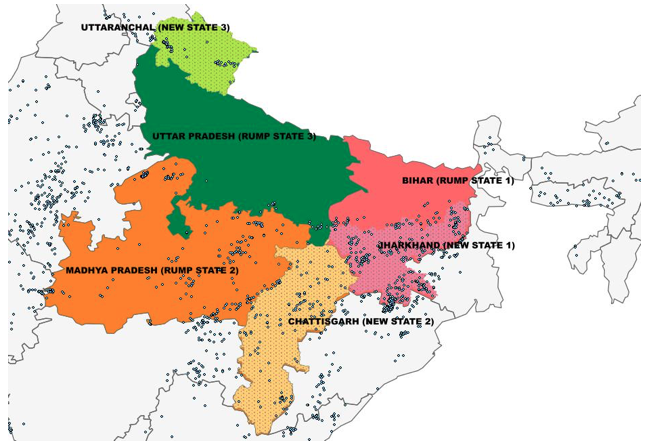 We exploit the formation of new Indian states in 2001 to show that not only do the effects of the state breakup on local economies differ systematically across natural resource-rich and resource-poor areas within states, but they do so in accordance with the spatial distribution of natural resources within the newly formed states. As the main direct effect of state breakup is a change in state-level political institutions and in the distribution of resource-rich constituencies across states – with no change in natural resource endowments taking place at the local level – these empirical patterns point to the conclusion that the relationship between natural resource abundance and economic outcomes flows, at least in part, through a political channel. We pursue the political economy link by examining the evolution of economic activity, proxied by luminosity, before and after breakup across electoral constituencies. We thus examine 1,124 constituencies, comparing, across the new state borders, 186 constituencies that are resource-rich with 938 constituencies that are not, over the period 1992-2010 (the regression discontinuity design compares 540 similar constituencies in the optimal bandwidth). Constituency borders remained unchanged after breakup, but state boundaries change, and so do the weight of individual constituencies in determining state-level political outcomes and the concentration of natural resource rich constituencies in the newly formed states. The change in the distribution of natural resources post-break up is striking, with considerable heterogeneity in the concentration of resource wealth across the old and new jurisdictions (Figure 1). In one case, one of the new states inherits almost all the resource-rich areas post break up; in another case, the original state is natural resource rich but the newly formed states each inherit a comparable share of natural resource rich areas; in a third case, natural resources are sparse in the original state pre-breakup. The results we obtain are striking and seem to banish purely economic-based explanations to the back of the queue. In brief, the heterogeneity in outcomes (both in local activity and local inequality at the constituency level) is mirrored in the differences in the natural resource endowments at the local level and in the distribution of natural resources across the newly formed states. Specifically, economic outcomes in natural resource-rich constituencies are comparatively weaker when the new state they belong to inherits a large fraction of the natural resource-rich constituencies of the original state. Comparative economic outcomes for resource-poor constituencies, on the other hand, are less affected by changes in political boundaries. This empirical exercise is similar in spirit to that of Michalopoulos and Papaioannou (2014), who use the quasi-experimental effect of the colonial boundaries that partitioned over 200 ethnic groups across two or more countries. But while they use this approach to show that political borders do not matter, here we show that they do matter, and the effects of political borders vary in line with the proportion of natural resource-rich constituencies that are inherited by the new states. Our findings lend fresh and strong support to the prevailing view of the natural resource curse as conditional on the quality of institutions. The patterns we observe, with effects varying in line with the change in the overall proportion of natural resource-rich constituencies in the newly-formed states, strongly suggests a link with electoral accountability. We construct a theoretical framework of a political-economy mechanism accounting for this linkage. Rent grabbing and illegal mining in particular are more likely in natural resource-rich constituencies. State-level governments are responsible for law and order at the local level, and thus must be complicit in the illegal activities. The main discipline against rent grabbing is provided by voters who are worse off in both sets of constituencies. However, the presence of rents leads to higher incentives to sell votes to the state-level incumbent in return for allowing illegal activity at the local level. Hence the degree of rent grabbing at the local level is an outcome of the political bargain between state and local governments. When the proportion of natural resource rich constituencies in a state increases, discipline from other voters on the negative effects of natural resources decreases, leading to worse outcomes in states, which end up with a much higher fraction of natural resource-rich constituencies post breakup. It is instructive to compare the results here with a recent study by Loazya et al. (2014), who examine the impact of a sharp increase in revenues from mining across districts in Peru. They find that outcomes improved in mining districts, but inequality increases both within and across districts. They attribute the better outcomes in mining districts on average to the requirement by law that revenues are distributed back to mineral producing districts, while the increase in local inequality is attributed to capture by local agents. India could not be more different. Here, both redistribution and political power reside at the state level rather than the local level and thus allow the political bargain between local and state level elites to play a bigger role in determining outcomes. This difference could account for the different picture we observe for India. The increase in local inequality in mining districts, on the other hand, resonates with our findings, for similar reasons of local capture. Our paper highlights the possibility that the particular institution that matters in the face of large rents is where the authority to allocate rights and redistribute returns resides. The previous government of India had proposed a draft Mines and Mineral Development and Regulation Bill, 2011. This provided for a 26% share in mining profits for local communities, which would have been a substantial change in policy. The new government has instead proposed an amendment to the original Bill of 1957 that includes a rather convoluted provision for the sharing of benefits in local communities. It proposes the establishment of District Mineral Foundations (DMFs) in areas affected by mining related operations tasked to work for the "interests and benefits of persons and areas affected by mining related operations". Holders of mining leases are to pay the DMF an amount, not exceeding one-third of the royalty in the case of new leases and equivalent to the royalty in case of old leases. This amendment allows state governments to set rules for DMFs and determine their composition (Narain 2015). These new institutional arrangements might well be the key to the improved performance of areas with concentrated resources that might succumb to a local natural resource curse otherwise. However, the importance of incentives for local capture of the DMFs cannot be readily dismissed. Our study suggests that state division in the presence of substantial natural resource endowments can act as a trigger for the curse – unless the DMFs can successfully play their part and not be captured by local elites. Brollo, F, T Nannicini, R Perotti, and G Tabellini (2013), “The Political Resource Curse”, The American Economic Review 103 (5), 1759–1796. Dhillon, A, P Krishnan, M Patnam and C Perroni (2016), “Electoral Accountability and the Natural Resource Curse: Theory and Evidence from India”, CEPR Discussion Paper no. 11377. Michalopoulos, S, and E Papaioannou (2014), “National Institutions and Subnational Development in Africa”, Quarterly Journal of Economics, 129 (1), 151-213. Loayza, N V, J Rigolini and O Calvo-González (2014), "More Than You Can Handle: Decentralization and Spending Ability of Peruvian Municipalities", Economics and Politics 26(1), 56-78. Narain, S (2015), “The Making of Mining Policy”, The Business Standard, 19 July. Robinson, J A, R Torvik, and T Verdier (2006), “Political Foundations of the Resource Curse”, Journal of Development Economics 79(2), 447–468.